Picture yourself waking up to views from your bed of the Gulf of Thailand…enticing blue sea, sun sparkling off the water. Wander down the floating staircase of your apartment to the level below for breakfast on your ocean-view patio. Perched high on the hillside overlooking Koh Samui’s famous Chaweng beach your home is a peaceful haven yet you are just minutes from all the amenities that tourist-friendly Chaweng has to offer. Waking up to this view every day would certainly have me pinching myself to make sure I wasn’t dreaming. This two-bed, one bathroom modern duplex is part of a mixed project of villas and apartments with a shared pool, on-site restaurant, management office and security. Your monthly rent would be $1,000 for a 12-month commitment. That’s fully furnished and includes aircon, ceiling fans, Wi-Fi and satellite TV. Koh Samui, Thailand’s second largest island, sits off the country’s south-east coast in the Gulf of Thailand and has long been a favourite holiday spot for people from all over the world but, if you’re looking for a place to settle longer term, there’s lots to recommend Koh Samui. With its international airport, getting to and off the island is easy. In fact, Bangkok Airways, the airport operator, offers a Residents Card if you are staying long term, making the airfares in and out even cheaper. Thailand’s capital, Bangkok, is only an hours’ flight away. 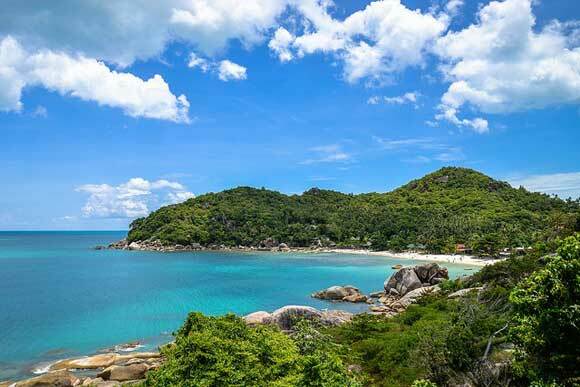 The lush, jungle-topped Samui has plenty to do and see, yet its relatively small size means it’s easy to navigate. You’ll find supermarkets, fine-dining establishments, wine bars and boutiques. Plus there’s hiking, kite surfing, paddleboarding and some of the finest snorkelling and kayaking in the Gulf of Thailand. The neighbouring Marine National Park also presents an aquatic wonderland waiting to be explored. Expats come to Samui for the sea, sand and sun. They stay for the affordable, laidback lifestyle. On the cusp of retirement, Canberra native Ian Dempsey explained, “When I needed a break from work, my son suggested Koh Samui. I was here for three days and decided, this is it, I don’t need to go anywhere. I’m home!” Twelve months on, Ian is loving island life. 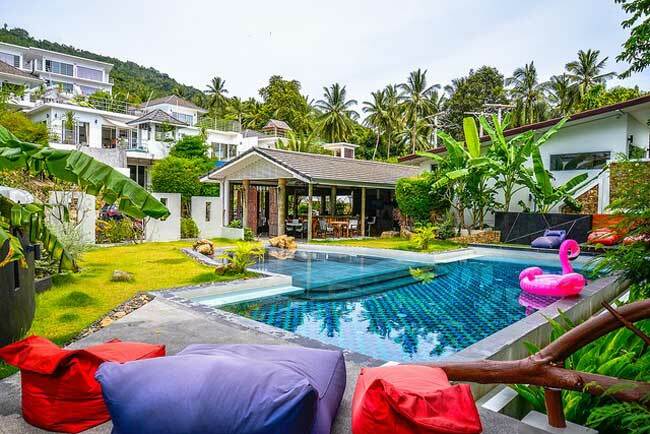 With an overall budget of $2,500 per month, Ian rents a fully furnished three-bed, two-bath pool villa in Bophut Hills with his partner. Of his overall monthly budget, rent is just under $1,000, utilities $110 and phone just $12, leaving plenty left over for dining out and enjoying his new home. The couple’s home is surrounded by lush, tropical jungle but just a five-minute drive from the beach village of Bophut where you can take your pick of restaurants, shops and beaches. Koh Samui features a tropical monsoon climate, so it’s sunny, warm and humid most of the year. The weather is quite wet in October and November, though, so make sure to pack your waterproof jacket if you plan to come at that time of year. Koh Samui also has four large, modern hospitals. And since English is widely spoken, you won’t have to worry about being misunderstood when speaking to a doctor. Healthcare costs in Thailand are also extremely affordable.